Purpose: Sigma Pi Fraternity’s Master of Ritual program exists to enlighten our Brotherhood with a heightened understanding and appreciation for the secrets and mysteries to which every Sigma Pi holds sacred. By setting yourself along these trials, you will be paying homage to the over 100,000 Brothers who have joined our Fraternity to sculpt it into what it is today. The Master of Ritual quest is comprised of a series of ten trials that make up four degrees. The trials of each degree are considered to be more difficult than those of its predecessor. Trials one through eight may be completed in any order. However, degrees must be earned in order, regardless of advance trials’ completion. Mentors, once acquired, will act as the first source for answering questions. If they are unable to assist, the Ritual Committee may be reached at ritual@sigmapi.org. What is Master of Ritual? The Master of Ritual quest is a self-paced study course of our Ritual that includes mentoring and fellowship opportunities. Participants who complete the entire quest are deemed Masters of Ritual by the Grand Chapter Ritual Committee and receive a special medallion. Greater personal Ritual fluency and appreciation. Recognition of your efforts by way of special lapel pins and a Mastery Medallion. Build Mentor/Mentee relationships with other brothers participating. Make real the Fraternities Ideals. Reduce potential for hazing and risky behavior by ensuring YOUR chapter is performing all of our ceremonies correctly. Be the local Ritual expert! Strengthen relationships with Alumni and Advisors by working through the program together. Provides training and new duties for Heralds who participate. Who can join Master of Ritual? ALL initiated members of Sigma Pi Fraternity, International. 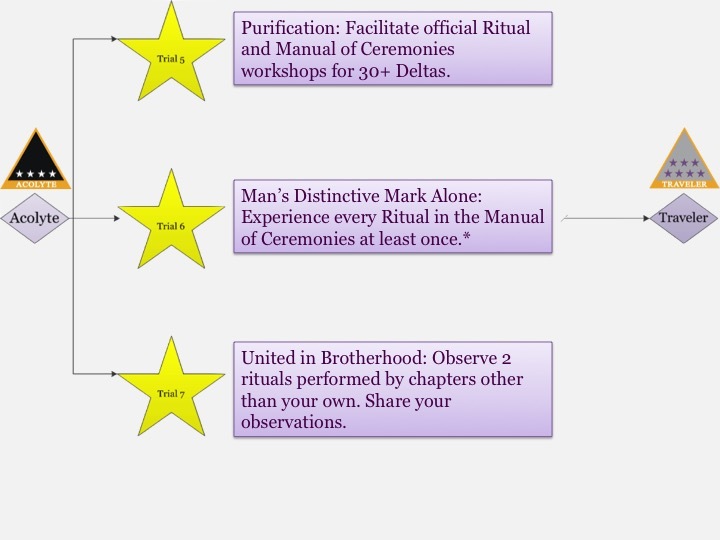 Master of Ritual was designed to be equally accessible by Undergraduate and Alumni brothers. Master of Ritual is 100% optional. The idea is to provide a quest to deeper ΣΠ wisdom for those who seek it. 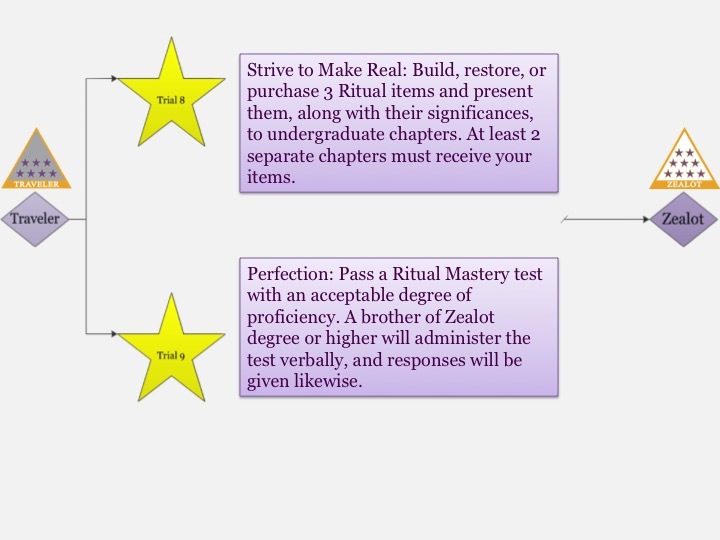 If I've already completed some trials before joining Master of Ritual, can I count them? No retroactive trial completion method has yet been approved. The Ritual Committee is dedicated to both the accessibility of the quest, and its integrity of intent. 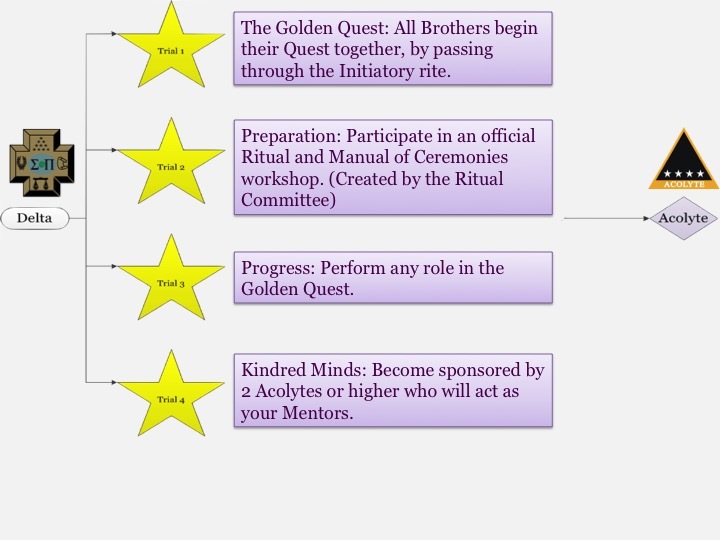 Currently, all brothers begin their quest anew when joining and must redo any trial tasks they may have previously completed in order to receive credit. How can I find out who is already in Master of Ritual? 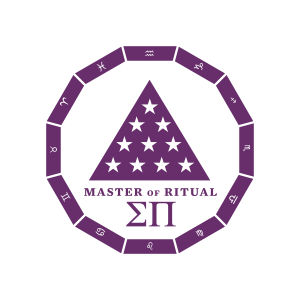 MySigmaPi.com will allow you to search the Sigma Pi database for other members on the Master of Ritual quest by location, degree, and contact information under “Member/Alumni Search” –> “Standing”. You are already in the right place! Click the “Application” button at the top of this page and complete the form. Once submitted, a member of the Grand Chapter Ritual Committee will confirm you are an initiated membership in good standing and send you a confirmation email welcoming you to your Master of Ritual quest. May trials and degrees be completed out of order? Trials one through eight may be completed in any order. However, degrees must be earned in order, regardless of advance trials’ completion. i.e. 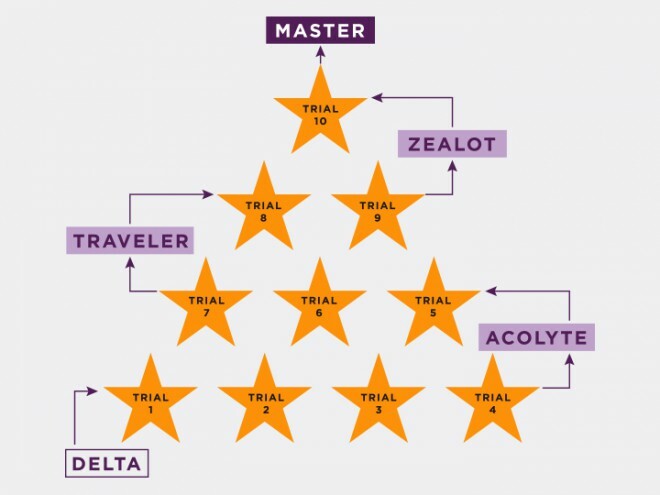 if trials 5, 6, and 7 have been completed but trail 3 remains incomplete, the Traveler Degree may not may earned since the Acolyte Degree must precede it. 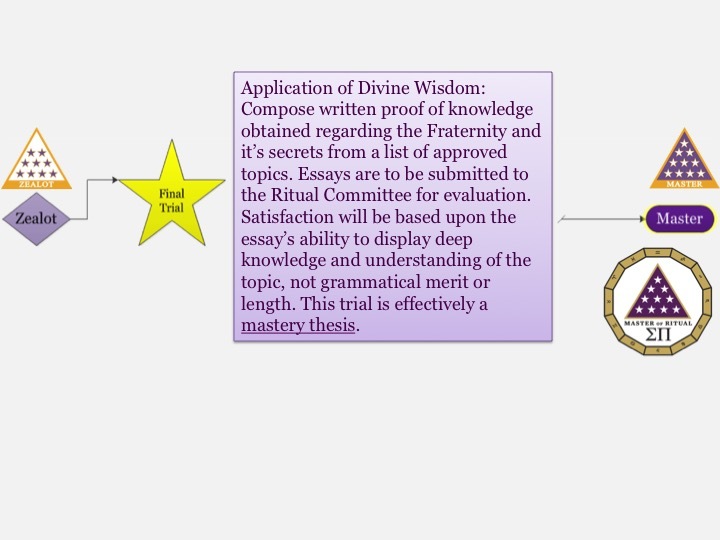 Since everyone starts at the beginning of the quest, and people with higher degrees are required to witness the completing of each degree, some brother can act with “Honorary” degrees in order to supply more witnesses initially. Should a person with an “Honorary” degree earn the same degree naturally, he should simply discard the “H.” from his signature of approval. How long does it take to complete Master of Ritual? Master of Ritual degrees are increasingly difficult and/or time-consuming by design. While it is estimated that one could aggressively achieve Mastery within 6-12 months, a more typical pace is likely to take a full Biennium. Many may complete some, but not all four degrees; it’s each member’s choice as to how far they progress. How much does Master of Ritual cost? Master of Ritual is completely self-funded by a one-time enrollment fee of $50 USD at the time of application. Should you lose your Quest Journal, you may purchase a replacement for $10 from the Executive Office. Broken/Lost lapel pins may be replaced at no cost. What do I do when I complete a Degree? You are already in the right place! Click the “Degree Completion Form” button at the top of this page and complete the form. Once submitted, a member of the Grand Chapter Ritual Committee will review your submission and send you a confirmation email confirming your new degree and shipment of your new materials. All questions can be directed to ritual@sigmapi.org.